MusicFirst announces an exciting partnership with MatchmySound™ to create PracticeFirst™, an affordable, online practice and assessment tool offering innovative features. Accessible from any internet-enabled device, PracticeFirst allows students to practice anytime, anywhere, with instant feedback and flexibility that has never been seen before. Perfect for band, orchestral and choral practice, PracticeFirst, powered by MatchmySound™ technology, gives teachers easy-to-use tools for creating assignments that are broad or individualized to each student. Assessment and feedback are instantaneous. 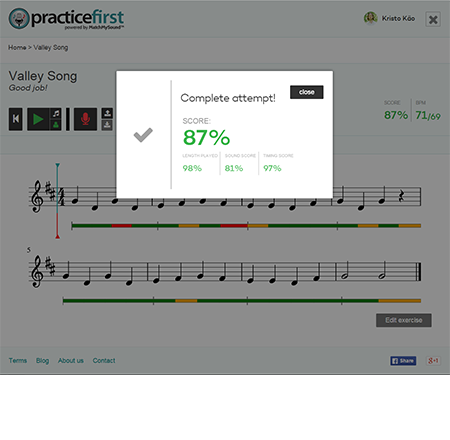 Students can practice any instrument, including voice, using PracticeFirst’s web-based, easy-to-use interface. Band instruments, orchestral, choral practice, even polyphonic instruments like guitar and piano can all take advantage of PracticeFirst’s intuitive lessons and feedback features. Not only does PracticeFirst, powered by MatchmySound™ technology, respond with pitch and rhythmic corrections, it can also judge tone for both instruments and voice. 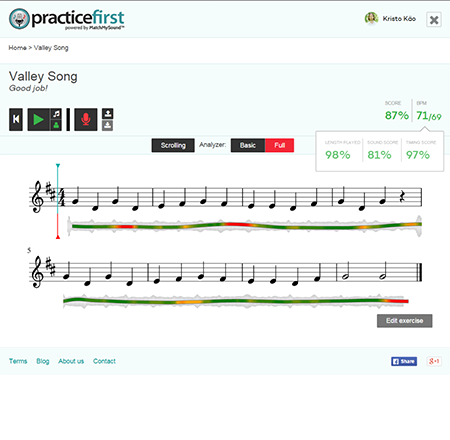 PracticeFirst enables student musicians to become more accurate and more musical. PracticeFirst comes with a library of useful practice content for students of all levels, plus teachers can upload their own exercises – an exclusive feature only found with PracticeFirst. Additional content from top education curriculum publishers will be available as an add-on purchase that can be incorporated into the PracticeFirst library. As students practice, they can play or sing along with included accompaniments, and a metronome feature is integrated into the lessons. Student assignments can be recorded online and teachers can easily review them whenever they wish. PracticeFirst is exclusively available through the MusicFirst online classroom and is fully integrated in the classroom’s gradebook, scheduling, portfolio-building and other features. Completely web-based, PracticeFirst, powered by MatchmySound™ technology, does not require any additional software to be purchased or downloaded onto any device. Students and teachers simply log in and use it anytime, anywhere. Teachers can track assignments and progress, and assessment tools are built right in. Subscriptions to the MusicFirst online classroom, including PracticeFirst, start at only $6 per user per year. PracticeFirst will be available August 1, 2015. To find out more go to www.musicfirst.com/practicefirst. Established in 2012, MusicFirst is the Digital Education Division of the Music Sales Corporation. The Music Sales Corporation was founded in 1935 by the Wise family, chiefly producing classical and tutorial material. Today the US company is a major copyright holder in both popular and classical music. Located in the heart of New York City, this ofﬁce houses a multi-faceted group of executive, administrative, editorial and production staff. The extensive copyright and licensing department manages the ever-growing Music Sales catalogue. Also based here are the promotion and publication departments of the vast G Schirmer/AMP music catalogue with its many eminent composers that include John Adams, Samuel Barber, Elliott Carter, John Corigliano, Tan Dun and Gian Carlo Menotti. To learn more about the Music Sales Group, visit www.musicsales.com. MatchmySound™ is part of the educational technology company, Accelerando, LLC. Accelerando's mission is to make learning music fun, exciting and affordable. Its product line includes MatchmySound™ (assessment and feedback services for students, teachers and schools) and Musician Toolkit (tools for private music teachers and their students). Later in 2015 Accelerando, LLC will launch a third service, an edutainment platform for singers and instrumentalists. To learn more about Accelerando, contact support@musiciantoolkit.com.